The 2018 Honda Pilot offers 8-passenger seating, a powerful standard V6 engine, impressive advanced safety and driver-assist features plus Honda's well-deserved reputation for value and reliability, all at a competitive price. Although not as roomy, luxurious or off-road capable as some, the Pilot nevertheless offers everything a growing family needs now and into the future. The Honda pilot feels like a luxury vehicle at a non luxury vehicle price! My 2017 Honda pilot is sleek, smooth, comfortable, roomy and high tech! I previously owned. 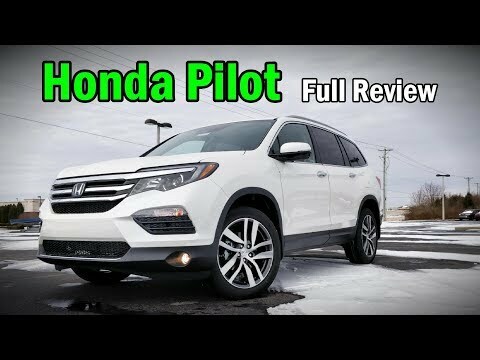 2015 Honda pilot and hated it because it didn't not have the features that I felt it should for the price. I was happy to see that Honda upgraded the 2017 pilot with all of the features I wanted. I fell in love with my 2017! Now I feel like I got exactly what I paid for the car play makes driving and listening to music a breeze. The seats fold up quickly and easily with little to no effort at all! The only problem I have with my heated seats is that they are not as hot as I would like. I love the built in remote start, side mirror and reverse camera! The back seats are very spacious even for adults. Safe, spacious, comfortable. It is a smooth drive in a all types of weathers. I currently own a 2018 Honda pilot. This is by far the best car I have ever had. The drive is very smooth and comfortable. It is very spacious especially if you have babies and have to haul around car seats. The trunk is very big and expands if you put the last row of seats down. The cameras are convenient for reversing and very helpful when you park. The in-lane feature helps you stay in your lane and is especially handy when you are driving on the highway. The key fob has a convenient feature to start your car without having to go to your car. This is great for winter season. 2018 Honda pilot- a perfect fit. Excellent gas mileage and performance on in town drives and long out of town drives. Beautiful detailing of exterior, Bluetooth hands free system which is great. Heated leather seats with lumbar support makes a luxurious ride. Good pick-up for passing v6 engine. Consistently good mileage, even traveling to Arizona and back to Wyoming. Excellent service package and warranty. I will always sing the praises of Honda pilot. Three row seating, so easy to put down and raise seats. Also, slide-forward second row access makes this car a dream when carrying grandkids and dog. Honda (American Honda Motor Co.) is recalling certain 2018 Honda Pilot and Ridgeline vehicles and 2018 Acura MDX vehicles. The front driver and passenger powered seats in the Honda vehicles and the driver powered seats in the Acura vehicles may have been assembled with improperly manufactured rivets. In the event of a crash, the rivets can break causing the seats not to be secured to the floor. As such, these vehicles may fail to comply with the requirements of Federal Motor Vehicle Safety Standard (FMVSS) number 207, "Seating Systems," and 210, "Seat Belt Assembly Anchorages." In the event of a crash, if the seat does not remain secured to the floor, the seat occupant has an increased risk of injury. Honda will notify owners, and dealers will replace the driver seat frame assembly in Acura MDX vehicles, and replace the driver and front passenger seat slide rail frames in Honda Pilot and Ridgeline vehicles, free of charge. The recall began May 30, 2018. Owners may contact Honda customer service at 1-888-234-2138. Honda's numbers for this recall is D0S, and T0T.